As my grandparents have grown older my experience with them has taught me a lot, and sometimes small things can make a worthwhile difference. The television is often on for hours and something as basic as switching channels can become tricky for elderly people with the modern remote controls we have now. Manufacturers tend to stuff many buttons onto one slither of plastic. 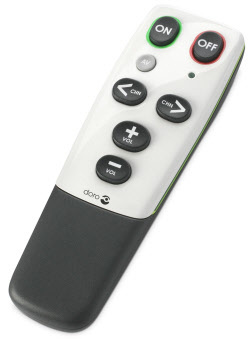 But there is a solution, you can buy a universal remote which is designed to be easy to see and use. There are a few different ones on the market, so here I have collated the best few based on sales and reviews, with information on each product. These are all universal meaning they can be paired to many different TV’s. They aren’t listed in a particular order because they all get good reviews, it’s more a case of which one will meet your requirements. 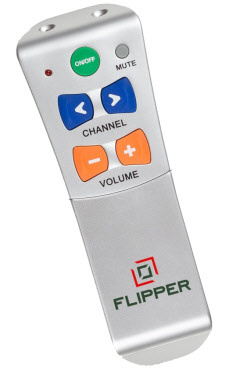 The flipper not only has a great name it also gets very good reviews from existing users. And it has a brilliant simplicity which is all that is needed by many older people. You can turn the television on or off, and adjust volume and channel. What more could you need. It is so simply laid out that once someone knows the buttons you don’t even need to look at it, the positions can be remembered. The manufacturers of this one say it has ‘hard keys for best tactile feeling’ which is very good. Compatible with all major brands of TVs as well as DVD players and even some stereos. So it is a real all-rounder. Also gets many positive reviews. This one is different to the others in that it has a lot more buttons, so it is perhaps not ideal for those who really struggle and need something uber simple. But for those just in retirement who can’t be bothered with the latest fancy remotes, or those who have poor eyesight but otherwise are in good health, this may be ideal. The buttons are all evenly laid out with large square sizes and clear labeling. All 3 get good reviews but be sure to look at more details before checking out. Don’t necessarily go for the cheapest, this is not the sort of situation to be trying to save a bit of money, the best value for money will come from the one which is easiest to use! There isn’t a huge amount of choice available in this market so I’m afraid your options are limited. It is a bit surprising considering we live in an aging population and demand for electrical equipment like this will rise. But we are where we are at the moment. Despite the lack of depth in choice these all have good reviews from what I have read and will hopefully fulfill your needs, or that of your relatives. Remember that in the UK legally you can cancel an order within 7 days of receiving it, without a reason for doing so, it is referred to as the “cooling off period.” You will get a full refund from the retailer if you change your mind. If what you purchase isn’t as good as you hoped for, perhaps it isn’t as easy to use as you expected, then return it and try another one instead. To keep things simple, and because they are very competitively priced I’ve have only linked to Amazon for this top list, but if you don’t like shopping there then also check other retailers, or if you are a bargain hunter give eBay a blast. Good luck in your shopping, I hope you find what you need. If you are a manufacturer of these products, or someone who has used a better remote control than any of these let us know and we will improve the information further on this page making it more useful for those in need. All contributions to this free guide are greatly appreciated.